A Large number of PV systems are under performing due to poor site selection, system design faults, frequent equipment failure, low solar irradiation access, unplanned grid failure or equipment mismatching. Some of these issues are external and often not in the hands of the system designer but most of them are because of poor design practices, inadequate installation planning or incomplete understanding. IAREEE focused mainly on the cognitive development of renewable energy, contribute to the transition to renewable energy sources, and stimulate scientific innovation younger generations. Proceeding from this principle, IAREEE has developed their laboratory equipment’s range aimed at different groups of trainees starting from schools and that it considers the future of the next academic energy and creativity that the seed you need to develop professionally and carefully twist. Also comes youth training within the academic institutions, engineers and technicians out of their importance in the coming years in the transition to self-reliance on renewable energy, at the head of the targeted sectors with equipment and training, which aims, to simulate realism systems to a deeper understanding of the systems performance. 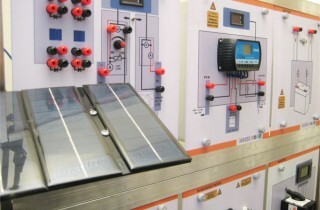 The photovoltaics solar Training System provides in-depth coverage of basic SOLAR energy systems. It covers in detail the principles behind the production of electrical energy from solar power. Finally, the training system introduces students to the storage of electrical energy produced from renewable resources into lead-acid batteries for future consumption. The Photovoltaics IA1601 simulator enables project work to be carried out with industrial components. The system permits realistic simulation of the progression of the sun. Simulators make it possible to carry out the experiments in the laboratory without the sun. - The courseware includes student manuals and instructor guides with all the theory required to perform the hands-on experiments. - All workstations, modules, and components are very sturdy to ensure a prolonged service life in a demanding environment such as a training laboratory. - The modular design approach of the training equipment allows a large variety of courses to be performed using a small number of modules, without unnecessary duplication of equipment. - electrical symbols representing the components used in a laboratory exercise are clearly silk-screened on the front panel of the modules. Solar Charge Controller : PWM 30A 12V 24V LCD Display USB 5V.